Today’s item is from Byter Vince, a collection of questions and answers from Hollywood Squares. This was an American panel show in which contestants sought to win prizes in a game of noughts and crosses. Instead of placing a nought or a cross on a board, however, they asked celebrities in the noughts and crosses cubes questions. The contestants then had to decide whether the answers given were true. (I think they copied the concept off the Oz version, Celebrity Squares). 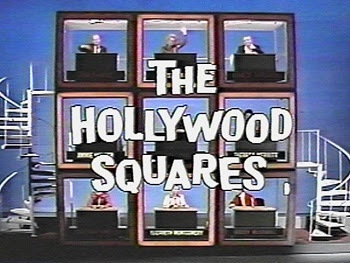 From the original Hollywood Squares TV show... These are from the days when game show responses were spontaneous and not scripted as they are now. Peter Marshall: As you grow older, do you tend to gesture more or less with your hands while you are talking? Peter Marshall: Eddie, according to the Institute of Motivational Research, a wife should be ware if another woman takes an interest in a certain item of her husband's clothing. What item? Peter Marshall: Is it possible for the puppies in a litter to have more than one daddy? Peter Marshall: At NASA, what keeps the cool air running around in the spacesuits? Peter Marshall: According to Better Homes and Gardens, Is it a good idea to give your yard a light sprinkle? Paul Marshall: What is a good reason for pounding meat? Paul Marshall: According to Ann Landers, what are two things you should never do in bed? Paul Lynde: Point and laugh.